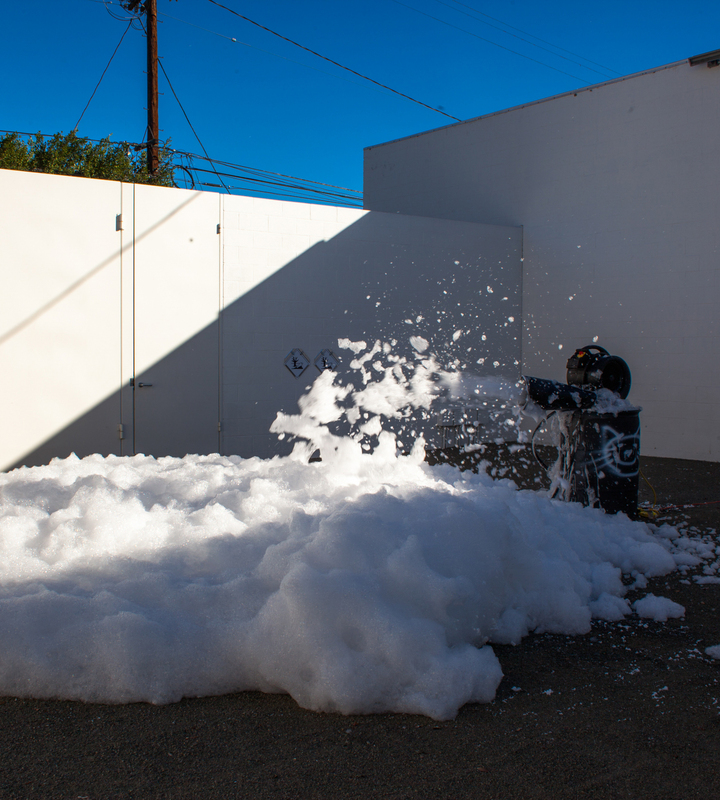 A foam machine gushes a massive cloud of soap lather from a black oil barrel in the courtyard. Plastic flowers stick out from a miniature blue Hanjin shipping container in the foyer. 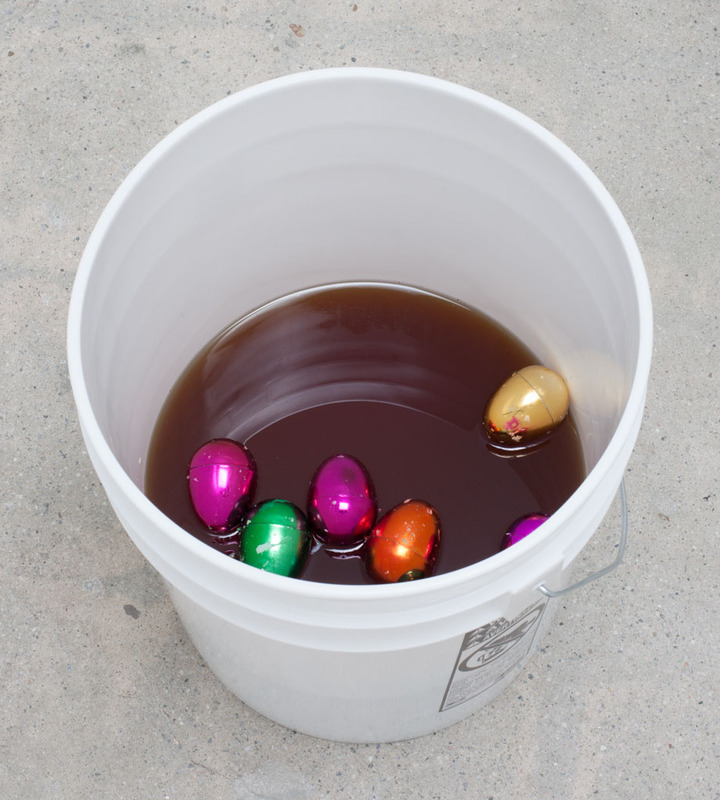 A bucket of murky peanut oil, collected from a trendy local restaurant, sits on the floor in a side room; a few shiny plastic Easter eggs swim in it. Lead blankets, used to shield bodies from radiation, are hung on chromed towel racks. 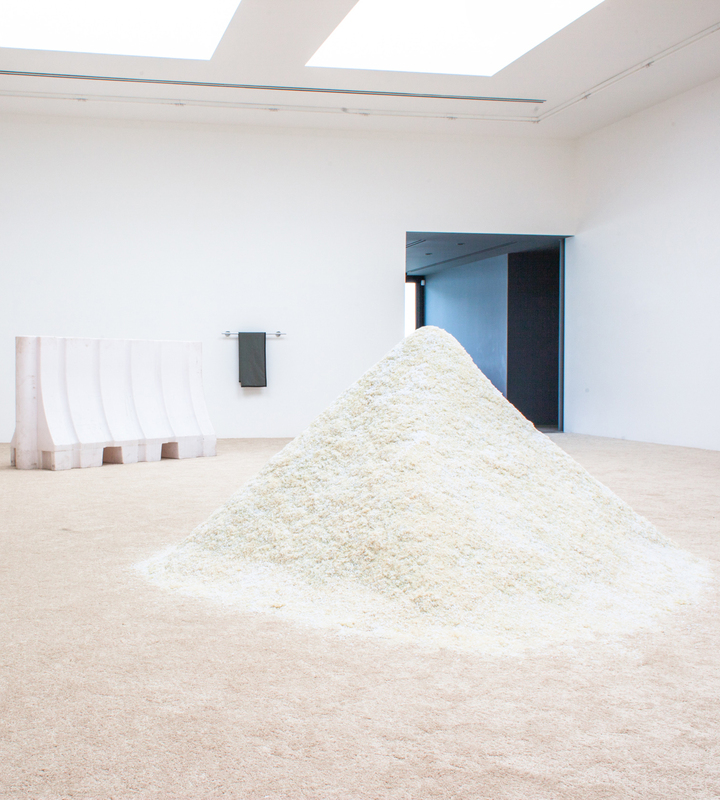 A pyramid, constructed with a mixture of rice, polyvinyl chloride imitation rice, freshwater pearls, and plastic pearls, is erected in the center of a main room that is entirely covered with cheaply produced beige synthetic carpeting scattered with plastic K-rails, polyurethane rubber brains, and latex bones are scattered. Plastic flowers are implanted in an interior wall. A scent diffuser in a back room constantly emits an irritating odor that simulates off-gassing. 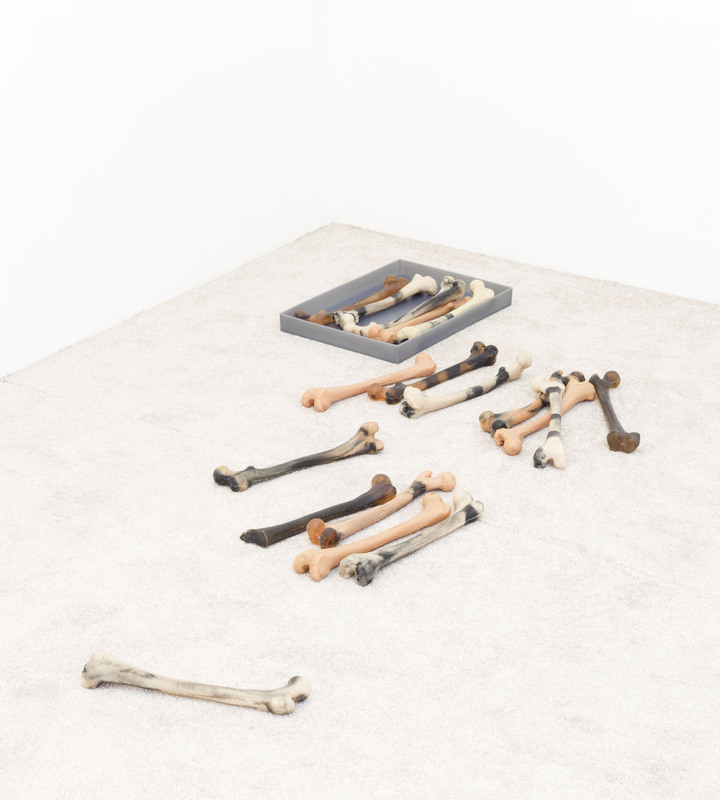 Amy Yao transforms Various Small Fires Gallery into a quiet and eerie excavation site littered with biofacts that await the viewer to discover and to ponder upon. The ecological data uncovered from these objects confronts us with the pressing reality of a contaminated world in the wake of the Flint water controversy and the Porter Ranch gas leak. The title of the show, “Bay of Smokes,” refers to the name that the Spanish bestowed on Los Angeles’s San Pedro Bay in 1542. Born and raised in Los Angeles, the city of eternal sunshine, Amy Yao and her sister Wendy were members of the all-Asian American riot grrrl band Emily’s Sassy Lime in their teenage years, and later continued on in experimental sound performance. At the age of 22, Yao and a group of friends launched the legendary gallery China Art Objects in Chinatown, where a cluster of galleries soon formed. From 2004 to 2012, the Yao sisters organized Art Swapmeets in the High Desert, where artists from all over the world gathered to sell and bargain-hunt their works. 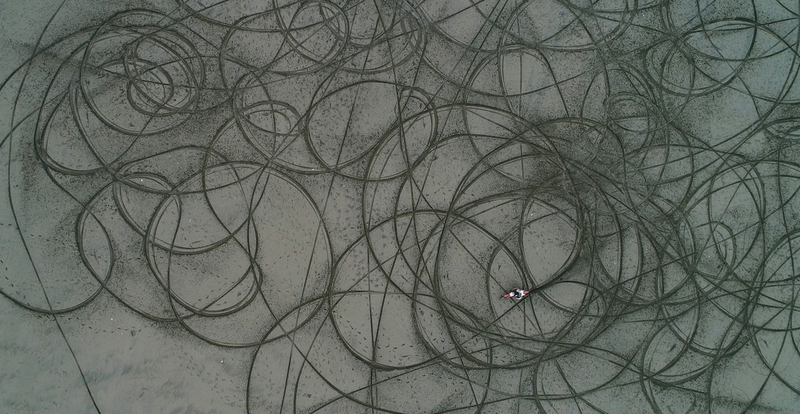 After completing her MFA at Yale, Amy Yao relocated back to the West Coast, to San Pedro Bay, the site of the Port of Long Beach and the Port of Los Angeles, which together constitute the busiest container port facility in the United States. The blue-collar community is also crowded with manufacturing sectors. As a result, the area suffers some of the worst pollution in the entire country. Bunker fuel and heavy diesel exhaust generate an enormous amount of toxic air pollutants. Additionally, the area maintains a large oil industry with wells located both underground and offshore. The drilling, fracking, and refining of oil exacerbate carbon footprints and toxicity in the environment. To make the matter even more biting, the water quality also ranks among the worst, mainly due to urban runoff containing untreated garbage, chemical pollutants, and biological pathogens from the metropolitan area. This is where Yao picked up surfing. It should not come as a surprise that Yao’s highly anticipated solo exhibition interrogates different forms of contamination in industrial and domestic spaces. Her works—spanning sculpture, site-specific installation, olfactory installation, digital print, and audio—smell acrid and look suspicious. Employing store-bought cheap consumer goods, she highlights causality in the fabric of everyday life that bears lethal consequences. Contamination is rubbed on our skins and ingested into our stomachs. It aggravates our nostrils and infects our bodies. Imminent threats to the relationships between nature and society alert us to a disaster subculture in which our ethos and social function are increasingly shaped by the anxiety of recollecting and anticipating environmental calamities. Yao lets it all out. Her installation creates a sensory and narrative experience that confronts the viewer with the dystopian and fragile landscape of modern society, imperiled by unsettling breakage, slippage, spillage, and the disruption of systems and processes. The palpable aging of her materials evokes the question of lasting. Plastic flowers implicate Bill McKibben’s “end of nature.” Silicone brains and bones suggest an uninhabitable earth. And the persistent off-gassing further inflicts phobia: our environment has finally turned against us. 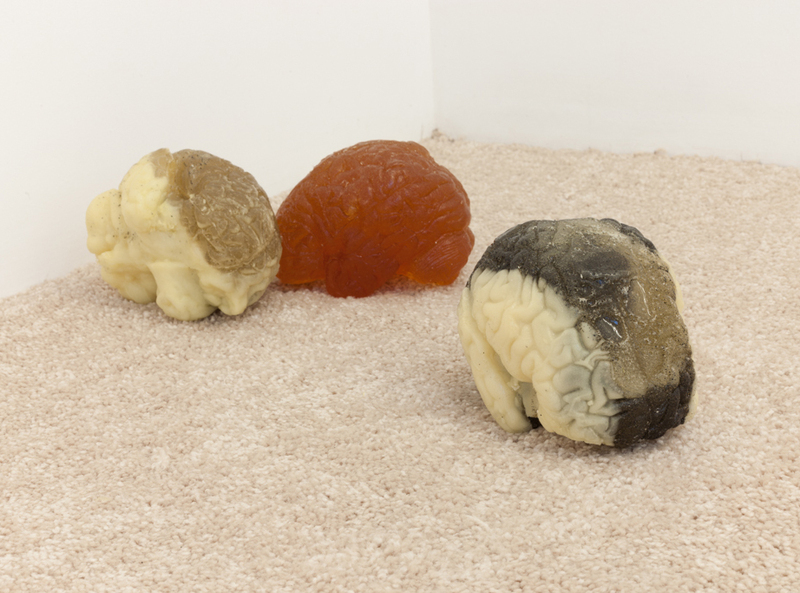 Amy Yao’s work is a testimony to collective anxieties around environmental degradation and its menace to the body. In making art, however, the use of material is not immaterial; it carries both literal and metaphorical meanings. 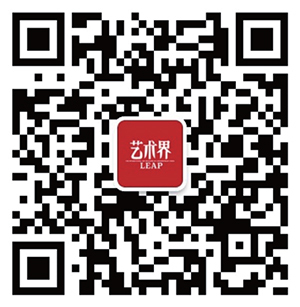 Would Yao’s critique of ecological footprints resonate louder, her protest more convincingly, if she incorporated recycled or less harmful materials instead of purchasing and creating contamination?